I tried to keep this list in the realm of possibility, and it is ordered by a mild amount of prioritization. Xcode Swift Support. Yes, you can build Swift apps in Xcode, and I do. And yes, there have been improvements in this area. There are just some fundamental things broken with building Swift apps in Xcode. For example, I hope I never have to see that “Xcode can only refactor C and Objective-C code.” dialog again. Frankly, I would be embarrassed if I had to put an error message in one of my apps to the tune of, “sorry, you tried to do something legitimate that we just don’t support.” And then to think that this message has been around for going on two years!?!?! Additionally, while less frequent as a year ago, I still get SourceKit crashes in Xcode. That’s when all of a sudden syntax highlighting of your source code stops, and there is no autocompletion. It’s usually paired with an error message. And often, there’s no suggested course to correct whatever you did to crash SourceKit. It’s usually the case that you typed in some non-compilable Swift that rather than getting a nice error message, your IDE stops working. Do you think a third-party IDE would survive with shortcomings like this? I don’t. Faster test execution – I heard that Visual Studio, the .NET IDE, actually will run your test bed anytime you save a source file in your project. That sounds AMAZING! In order for that to be possible, test execution must be fast. Right now, just to run a suite of a couple hundred XCTest unit tests, it’s about 20 seconds. That needs to be sped up. Headless test runners – Right now, running tests (unit or otherwise), require a simulator or device to fire up your app, and run through the tests. This shouldn’t be needed. It would be so nice to run tests without the overhead of the iOS simulator or device. Continuous Integration Improvements – Xcode Server is a start, but so far from being something that would stand our as a continuous integration solution. I’d love to see Apple take strides to better supporting cloud-based continuous integration. 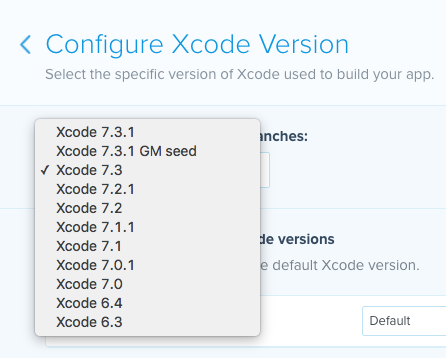 This may even include some amount of supporting xcodebuild on non-OS X based systems (Linux?). Headless test runners would help here too. Right now, without the help of something like Buildasaur, I can’t even get the status of a Xcode Server integration on a pull request. That’s a huge hole in me adopting Xcode Server as the sole solution for continuous integration. Oh ya, and what about even automating some of the process of app deployment, like submission to iTunes Connect? Wouldn’t that be delicious!? WatchKit Performance. 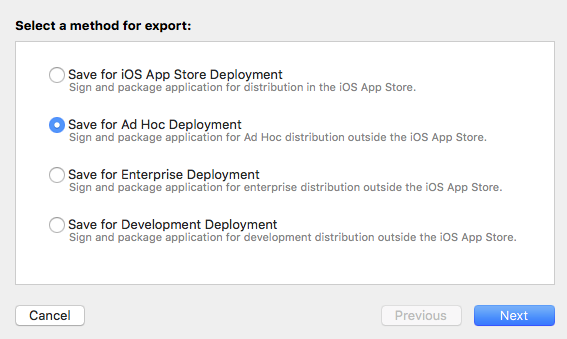 I’ll state right off the bat that I don’t actually have any WatchKit code in production apps at this point. I do have an Apple Watch that I wear everyday. I buy-in to the concept of wearables, especially for health and exercise tracking. The thing is, using the watch is so darn slow and unreliable. Whether I’m asking Siri to start a timer, or using the Strava watch app’s “Start Run” button, either the action simply won’t happen, it will take too long, or some random nasty side effect will happen (like my Strava workout will clobber the corresponding entry in HealthKit). Until WatchKit apps are speedy, and reliable, there’s no chance of success for the Apple Watch in the future. New hardware is not the answer here. It may be part of the solution, but the software stack needs a total revamp. That’s my WWDC 2016 wish list. If I didn’t say it before, I’ll just reiterate how exciting this time of year is for me, and should be for you too. Even if you need to support older iOS versions, don’t worry, the new features that are announced are still fun to play with, and you’ll eventually get to use them in your production applications. 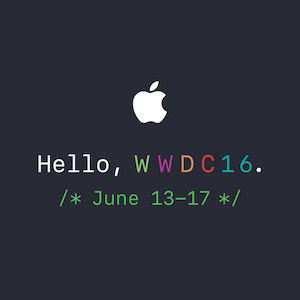 What’s on your WWDC 2016 wish list? If you didn’t see, Apple will be live streaming sessions daily, and posting videos or all sessions throughout the week. Starting next week, I’ll be posting recaps and highlights of all the sessions I find interesting as I consume all this great content from the comfort of my couch. Amazon Device Farm has been on my radar for some time now. It offers the ability to remotely test your iOS apps on physical devices that are located somewhere else. Remember my post about cattle vs pets, and how your continuous integration box should not be a pet? I wanted to test out how well Amazon Device Farm XCTest actually worked, and report back here on my experience so you know how to do it as well. Not only does moving your automated testing to the cloud move you away from owning a “pet” build box, but it is also a cost effective way of testing your application across a large number of devices and OS versions. You won’t need to go buying old iOS devices on eBay. 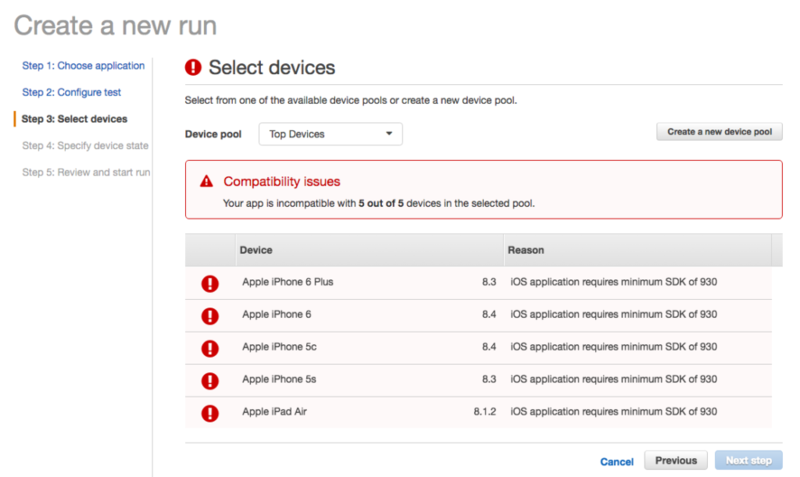 Amazon Device Farm supports all the way back to iOS 7. Ever accidentally upgrade your old iOS8 test device, only to realize that you can’t downgrade? With cloud based testing, you no longer need to worry about that. 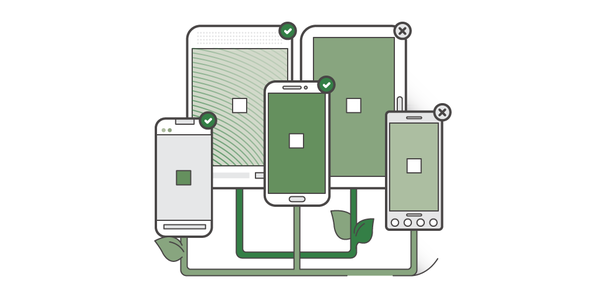 Amazon Device Farm supports many devices and OS versions, across iOS AND Android. You can take a look at the actual list of supported devices here. The goal is to evaluate and document getting a project executing Amazon Device Farm XCTest runs. 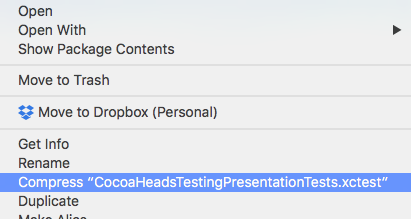 I’m going to reuse my sample project from my CocoaHeads presentation, you can find it here. 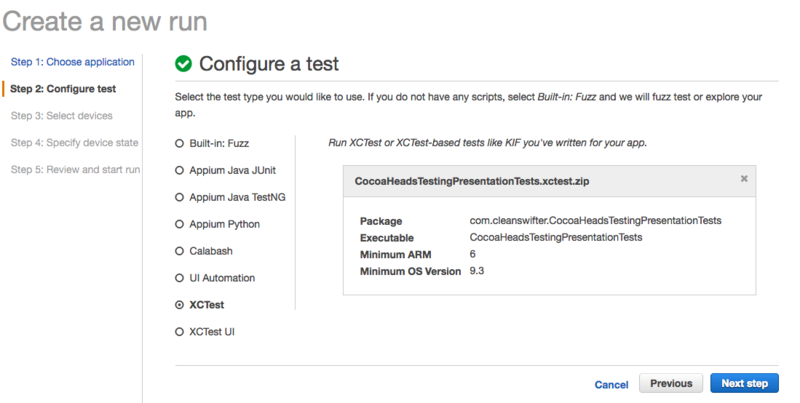 The project actually has three test targets setup: unit tests with XCTest, KIF tests, and FBSnapshotTestCase tests. My primary goal here get Amazon Device Farm XCTest running for unit tests. Getting the other two test targets running would be icing on the cake. Properly create the .ipa file – I achieved this by Archive -> Save for Adhoc Deployment, etc. Properly create and find the .xctest folder – I had a hard time finding the .xctest folder to zip up. It’s buried in your Derived Data folder. I used the command line find command to locate it. 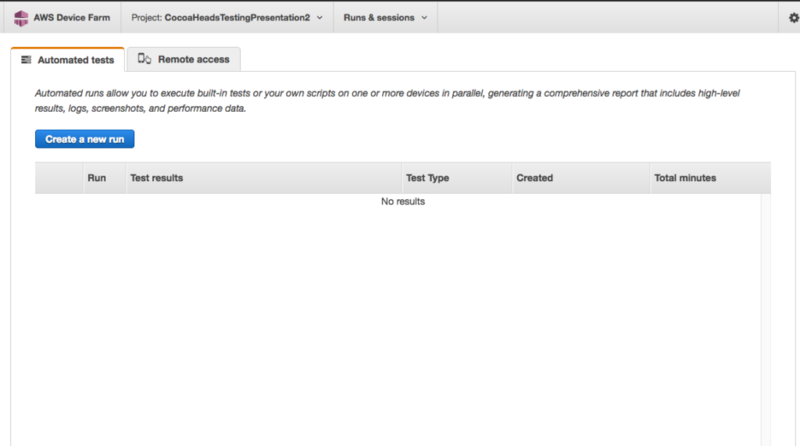 Also, Amazon Device Farm requires you to include any class under test in the test bundle as well. More details on those two steps later, so read on! A project in Device Farm represents a logical workspace in Device Farm that contains runs, one run for each test of a single app against one or more devices. Projects enable you to organize workspaces in whatever way you choose. For example, there can be one project per app title, or there can be one project per platform. You can create as many projects as you need. You basically have the freedom to use Projects as wide or as narrow as you want. I’m imagine a Project to be analogous to a Jenkins job. Just like a Jenkins job, a Project will consist of any number of Runs, which are basically just an execution of a given test script. To use Amazon Device Farm, you’ll need a Amazon Web Services account. Follow the instructions here for creating an account and setting it up. It’s a little more involved than just registering. You can actually create additional users within your AWS account to help segregate identities and access management, and it’s recommended that you do this to be used with Amazon Device Farm. Once you have your account setup, sign in to the Amazon Device Farm at https://console.aws.amazon.com/devicefarm. Now that you’re logged in, you’ll need to create your first Project. 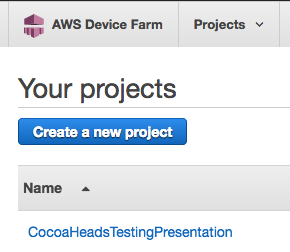 For this simple trial, I reused my Xcode project name for my Amazon Device Farm project name, “CocoaHeadsTestingPresentation”. Select your project from the project list, and you’ll see a page that will eventually show your test runs. Since you have no test runs at this point, the page is empty. Now, you’ll create your first Run. Select Create a new run. On Step 1, select the button that shows the Android and Apple icons to indicate that you are going to create a run for a native app. After selecting Next, follow through another couple prompts selecting the default options, and specify a location for your .ipa file and Xcode will code sign your application and create an .ipa file that will be uploaded to Amazon Device Farm. 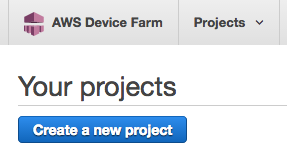 Go back into your browser that was left off on Step 1 of Create a new run in your first Amazon Device Farm project. Click Upload and navigate to your new .ipa file, and upload it. Unit tests will compile with each build – This should be the default setting, but it’s worth double checking. Open the Build action settings for the scheme in the Scheme Editor. Verify that in the Run column, your test targets are checked. This means that when you type Command-B or even run your app, your tests will be compiled too. SUT Classes are included with the test target – In order for your classes under test (aka SUT) to be available within the test bundle, you need to ensure they are included with test target membership. In my project, WelcomeViewController.swift was a class under test, so I needed to actually add it to the test target membership since this isn’t technically required in a Swift world with the @testable annotation for importing modules. Build tests for devices – Your XCTest bundle must be built for device, not simulator. Select a device, rather than a simulator. Compress it as a standard zip file (you can use Finder for this), and Upload it back in the Amazon Device Farm browser. Click Next step to select your devices for the run. One thing that annoyed me with setting up my first Run for an Amazon Device Farm XCTest was that when I finally got to the screen to select which devices to execute my Run on, the default list contained five devices, none of which were supported by my app. I would have rather’d some smarts on Amazon’s part to look at the lowest iOS version supported by my app, and then only show me “Top Devices” for that minimum iOS version. 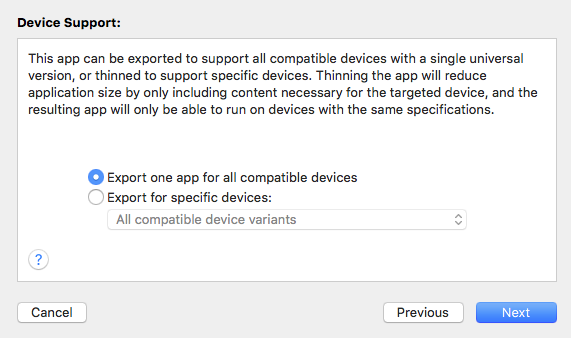 On the resulting screen, it’s obvious enough to select devices for a new “pool” – just make sure you select devices compatible with your app’s minimum version, because you won’t be prevented from doing that. Select Next step to specify initial device state. I didn’t change any of these values from the default for my app. Next, click Review and start run. The next page reviews your Run’s settings, and allows you to start it. Click “Confirm and start run” to start it. Boom, that’s it! At this point, you’re basically done. If all is configured correctly, your Amazon Device Farm XCTest will be running. Congrats! Here’s a couple observations from going through this setup for Amazon Device Farm XCTest. Next, I really need to investigate automating this. There’s no way I would frequently go through this in order to run my tests. It’s so much faster to run it from Xcode locally. There’s just too much clicking through prompts. Ideally, I want to connect this with my continuous integration server, so that’s the next thing I’ll look into. Just the simple act of running tests is really slow. For my sample project, that is totally bare bones, with ONE XCTest unit test, it took just over three minutes to run in Amazon Device Farm. That’s compared to like one second locally in Xcode. I’d like to try this with a larger code base and observe how long it takes. I hope the duration doesn’t lengthen with the size of the project or number of tests, but it probably will. At this point, I don’t think I’d put such long running tests in the middle of my code review workflow, but rather integrate these as nightly builds across a large number of devices. The hardest part of getting this setup was getting the precise build settings right, both for the app binary ipa itself, and the .xctest bundle as well. Amazon totally glossed over this in their documentation, which really prompted me to write this article. The good news is that in Googling around, I noticed Amazon support employees actually answering questions on Stack Overflow, and also participating in Amazon’s own dedicated form for supporting Amazon Device Farm. I noticed that there is a command line reference for Amazon Device Farm. In order to integrate Amazon Device Farm XCTest with my continuous integration procedures, I know I need to test this with more complicated projects, and also automate it. I’ll do that in a future post. 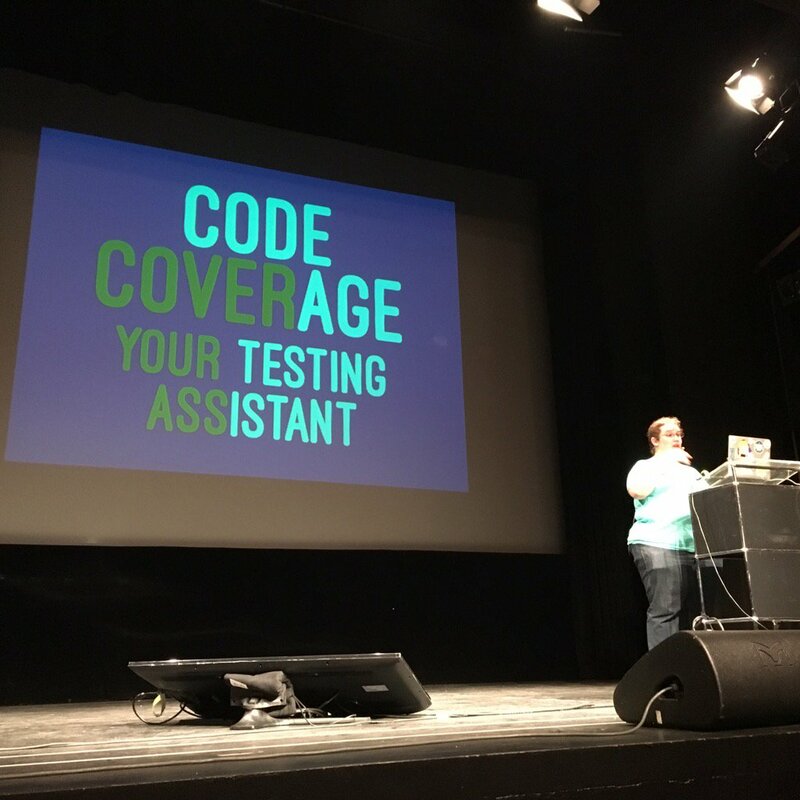 I caught this great picture on Twitter of Ellen Shapiro presenting at UIKonf last week in Berlin. Now, I’m not totally sure of the topic of the talk, but having heard first hand of Ellen’s passion on automated testing, and seeing this slide, I’m pretty sure it’s content would be something that I would endorse here at cleanswifter.com. If you aren’t following Ellen, you should be. I’ve seen her present several times, and she is my colleague on the raywenderlich.com iOS team. Besides Twitter, here’s an appearance of her’s on the raywenderlich.com podcast that you’ll enjoy. I’ll even leave you with a fun story from the first time that I met her. This was back at a CocoaConf in the fall of 2014 in Boston. During an impromptu lunch time session where developers could show off their own apps, Ellen stepped up to give a demo of Hum. It’s an app for musicians to help record little bits of audio so they can remember it later, for use when you’re songwriting. A major part of the app has to do with recording audio so you can listen to it later. Ellen blew people away in the demo by belting out, herself, solo and acapella, the opening line to Black Dog by Led Zeppelin. I think I speak on behalf of the whole room, that I was blown away by its awesomeness. I was a fan for life, and that’s before I came to learn about her passion for high quality iOS code. If you ever get to meet Ellen, tell her the Clean Swifter says Hi. PS – Thirsting for a tutorial? I’ve got something good planned for tomorrow- how to run your first XCTest on Amazon Device Farm. Be sure to come back and check it out. This amounts to more than 10 different environments that I would need to provide builds for various testers throughout the development cycle. Needless to say, 10 environments is a lot and need to be managed somehow. I was thinking of writing up each technique I’ve tried, but then I came across a useful article on “The App Business” blog, titled “A robust multi-environment build setup.” that clearly describes a couple of the most popular ways to do this. The majority of “The App Business” blog article recognizes some manual ways to manage your builds and the environments they are configured to connect to, including other iOS environment configuration. Later in the article though, “The App Business” goes a further extra mile by announcing an actual tool they created to help accomplish this, it’s called configen. configen takes a configuration file, and actually generates a Swift class to help manage selecting environments during build configurations. One qualm I have with the article. Using separate Xcode Schemes for different environment variables is a useful way to help separate our your iOS environment configuration. One thing I like about using separate Schemes that the article doesn’t mention, is that non-developer-types, like product managers or designers, may feel comfortable knowing where the dropdown is in Xcode to build for a separate scheme, while they may not feel comfortable having to modify code or run schemes to change environment options. One thing I would have liked configen to take farther is the ability for the end user of the app to be able to change the environment variables and other iOS environment configuration used for a given session of the app. I’ve seen this done several ways, but none that I’m happy with. The last time I did it, I actually coded my own interface for the user to select which environment to use. I wasn’t happy with how intertwined the resulting user interface code was the rest of my code base, there wasn’t good decoupling. Ideally, there’s a third party package, that can be modularly loaded, such that it is a drop-in solution. What’s on your wish list for iOS environment configuration? What aren’t I thinking of? How have you fared? I’d love to hear. By default, iOS unit tests in Xcode execute just like any other method, from top to bottom, in serial order. This is fine most of the time. Occasionally though, you’ll find the need to write a unit test for asynchronous code. And with the prevalence of closures in Swift, writing an asynchronous iOS unit test will become even more common place. It requires some imagination, but envision that this is some kind of complicated parsing routine that takes a long amount of time to complete. Depending on the outcome of parsing the input, either a closure success() or ‘failure()` (that are provided to the method) are guaranteed to be called at some asynchronous, non-deterministic point in the future. At the core of this method, an input string will be parsed, probably on a different thread. In some cases that will pass, and in some cases that will fail. We need to figure out how to write tests to verify that. The problem with this approach, is that assuming the long running code in parse(_:success:failure) is executed on another thread, `testParse_Succeeds()’ will likely complete before the parsing actually completes, thus never giving the test the chance to perform the actual verification. This will result in false positives, with no way to actually see the test fail. There’s a really cool API provided in an XCTestCase extension that makes testing asynchronous code possible. Tell XCTest to wait 1.0 second for the expectation to be fulfilled, or otherwise fail the test. (Good thing the timeout is configurable). That’s it, now you can write an asynchronous iOS unit test! Now you know how to write an asynchronous iOS unit test. Take a minute to try out these sweet extensions on XCTestCase. I think you’ll find a lot of creative uses for them. Keep in mind, it doesn’t necessarily need to be long running code that needs this solution, but rather any code that is going to execute in an asynchronous fashion. Do you unit test your web service API calls? Buddybuild self describes itself as a system that “ties together and automates building, deploying and gathering feedback for mobile apps.” I’m always on the lookout for something that makes the process of developing my apps easier. I wanted to give it a try and write a buddybuild review. I know fastlane is really popular now for the automation it provides, but I wanted to peek at something at a higher level where some of the legwork is taken care of for me. Lately, I’ve been bouncing between TestFlight and Fabric for some of this functionality, but those solutions fall short in one specific area: automatic builds with tests (whenever I say “build” in this buddybuild review, I’m talking about both compilation and test execution). Since I’ve been on a continuous integration kick lately with the posts here on cleanswifter.com, I figured I’d give you a full rundown with a buddybuild review. A hosted continuous integration solution – In case you didn’t see my post from yesterday, I’m tired of trying to maintain a physical build server. The idea of hosted continuous integration is very attractive to me. Integration With GitHub – I’m all in on GitHub, both github.com and the hosted enterprise instance. I want deep integration with GitHub from my automation solution. 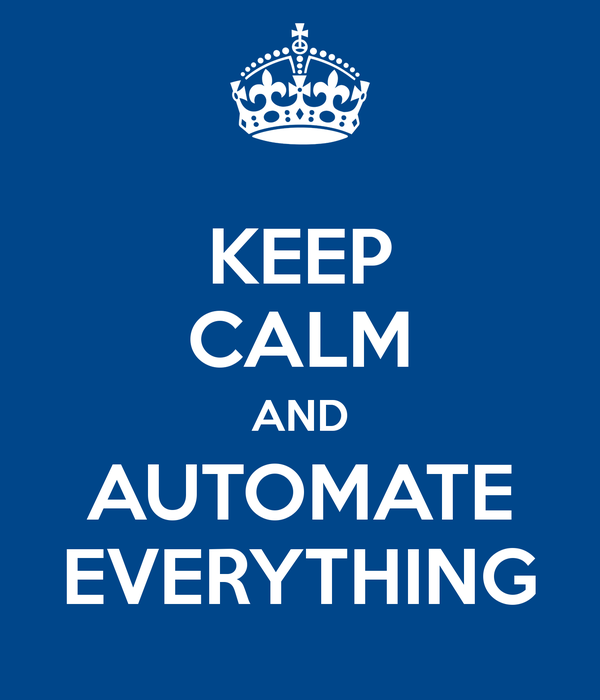 I rely on pull requests, and I need my build automation system to integrate with that workflow. Solid Documentation – In my opinion, when you invest your time in using a 3rd party product, you don’t want to waste your time with poor documentation. Any Other Bonuses – If there are any other niceties I discovered, I wanted to report out on those as well. Whenever trying out new supporting infrastructure for software that you write, never use your “real” code base to begin with. I suggest creating a fake project to use so you can feel out how to use the tool before then applying it to your real code base. 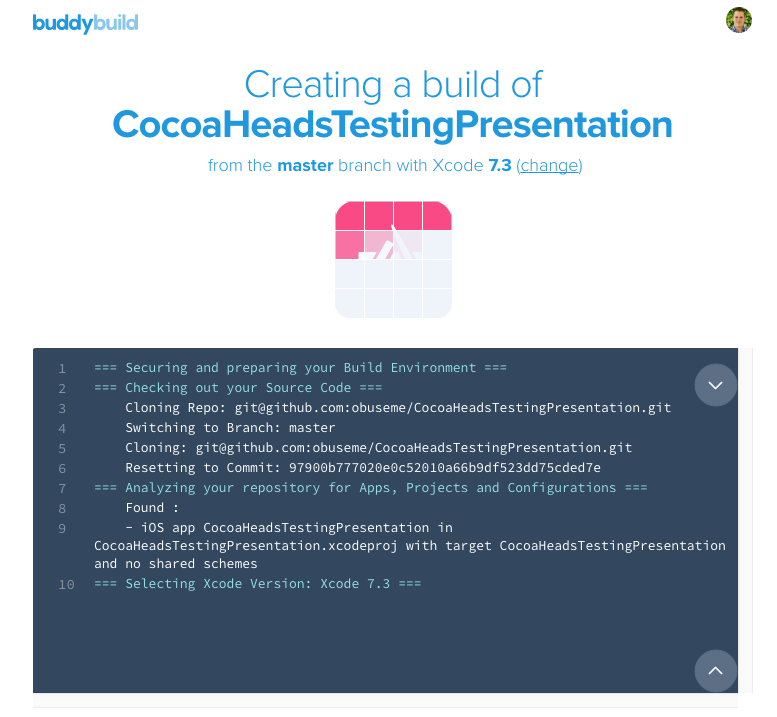 As such, I setup two apps in buddybuild: BuddyBuildSampleProject which started with a single test target for unit tests, and my CocoaHeadsTestingPresentation project which has three test targets: one for unit tests, one for KIF tests, and one for FBSnapshotTestCases. Initial impressions are always important, and buddybuild exceeded the bar for me. It’s an entirely web-based experience, and it’s beautifully designed. Not only is it visually appealing, but I had no problem figuring out where to find different options to do accomplish tasks. Also, there was a really nice first user experience that helps walk you through all the features of buddybuild. They even built a sample app that you actually download, just like a real beta tester so you can understand features that the buddybuild SDK can enable your beta testers to use. The buddybuild documentation is out of this world and crazy good. It’s comprehensive, well-written, and even goes out of its way to teach you about best practices about things like CocoaPods, Git Submodules, and Code Signing 101. As I worked through a couple problems getting my builds up and running, I had near immediate chat access with support personnel. They were very helpful in getting my issues fixed. Additionally, they were even open minded and sought feedback on how to make things better. Shout out to Dennis, Sid, and Rashin! Despite not having specific pricing information available at the moment (which I see as a bad thing), they guarantee that they “will always offer a free tier.” That’s awesome. I’ve tried both other hosted build automation solutions as well as having rolled my own, and I really like how buddybuild allows you to create different groups of app testers. And then for each group, you can specify the frequency that they will receive a build: Every build, nightly, or manually. This is really cool especially if you want to segment your tester base between developers, other internal stakeholders, and external public testers. You can verify the right people get the right builds at the right time. In setting up buddybuild, one thing that concerned me is that it asked for a lot of access to my source code repositories. Whether I was connecting GitHub or Bitbucket, buddybuild required full read and write access to my repositories with no explanation as to why. (I would have included a GitHub screenshot, but after having initially connected my account, I couldn’t find anywhere to disconnect it). Ya, I see this as a bad thing. No good thing in life is free. If I’m going to spend time building out a critical piece of my development and distribution workflow on something, I want to know that there’s a formal business relationship in place. I’m not looking to pay thousands of dollars, but rather just make sure that things are on the up and up, and that I’m not going to be left out to dry because buddybuild disappeared overnight, or that I can’t get support at some point. Right now, the builds on buddybuild are really slow. Using my vanilla Xcode project that literally had nothing else in it but the template provided code and unit tests, it took several minutes to build on buddybuild, where locally it was done in less than 10 seconds. My project with three test targets took five minutes. I can’t imagine how long these builds would take with a more substantial project with hundreds of tests. I don’t really have a good solution here, besides selling a instance of buddybuild that you could host internally in your own datacenter, but that starts to become a lot of work. If you are using hosted enterprise GitHub, you need to open a hole in your firewall so buddybuild has access to your code repository. This scares me, again, I don’t have a good solution here. There is no ability to specify which iOS version, or which device your tests will run on. This is crucial functionality for me in my continuous integration workflow. For a universal app that supports iOS8 and higher, I want to at least be able to run my tests on iOS8 iPhone, iOS9 iPhone, iOS8 iPad, and iOS8 iPad. Furthermore, running on device is even better than simulator. There’s no control for this right now exposed to me, the end user. Luckily, support was very responsive in helping me change the configuration behind the scenes. Ideally I don’t want to rely on them though. Furthermore, I’ll forget what I had him set this to, and there’s no place in the buddybuild UI for me to check. With Twitter acquiring Crashlytics and fastlane it’s going to be hard to catch up in a couple areas. I do really like the idea of having buddybuild abstract another layer of automation on top of tools like this though where I can just quickly click a GUI to configure things. My suggestion would be to go through fastlane’s suite of tools and add a similar feature into buddybuild. I think fastlane’s maturity is a good representation of exactly what developers are looking for in automating their workflow of creating applications. I’d also love to see code coverage reports, and static code analysis, and even other code-health metrics integrated with buddybuild’s dashboard. After my buddybuild review, as cool as buddybuild is, until they resolve some of my improvement areas, I can’t recommend it for use in a business critical application. The lack of pricing is a major red flag to me. As polished as their site is, and how well it works, the fact that there isn’t official pricing to establish a business to business relationship makes me feel like they are operating out of a garage with the possibility that they will shutdown at any moment (disclaimer: I got stuck when something similar happened with ship.io disappeared overnight – another hosted CI solution). I also don’t want to wait around for my builds to happen. I also really want to be able to configure which devices, simulators, and iOS versions that my tests run on- this is important in any CI stack. I need that to verify that my code works well, everywhere. The good news out of my buddybuild review is that buddybuild is working on all of these improvement areas so the outlook is good. I’ll keep an eye out for developments in this area and report back in the future. I hope you found this buddybuild review useful, if you want to try out buddybuild and either make your own impression, or use it for something non-mission-critical, I think you’ll be impressed with what they have to offer. An iOS continuous integration machine should not be a pet. Do you know what I mean by a “pet?” Have you heard the analogy for determining whether a server is a pet or cattle? Continuous integration machines should be treated like cattle, not pets. Without trying to sound cruel or inhumane, when cattle get sick, you can quickly replace it. 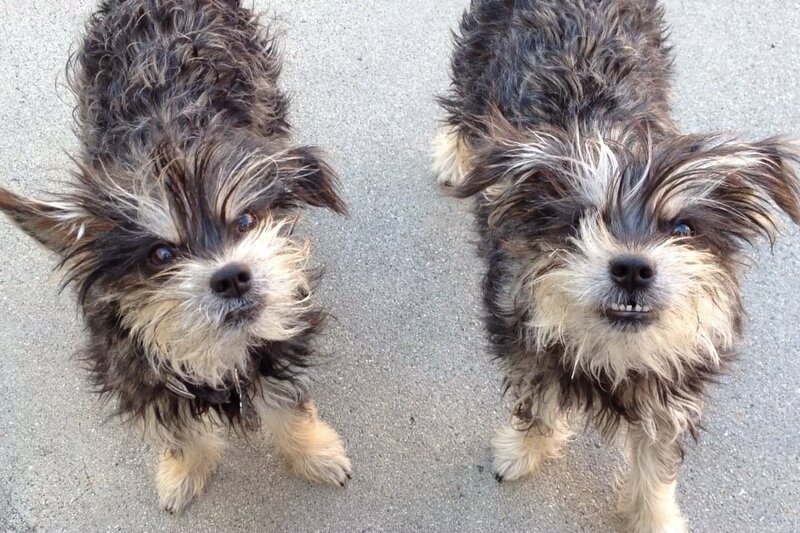 When pets get sick, you spend a lot of time and money to try and help them get better. Now apply this to your continuous integration machine. If you have a dusty old Mac Mini sitting next to you that is acting as your continuous integration machine, eventually the hard drive is going to die or any other myriad of problems. Do you want to be in the business of resuscitating the machine when that happens? Not me, I’d much rather be focusing on what matters, writing awesome new features for my end users. Imagine this scenario: you’ve been coding all night, and finally you get that hot new feature done, tests pass locally, and you’re ready to open a pull request. You push your branch, and for some reason Wolfie, your build server, isn’t powered on and won’t start up. Now your choice is to either spend time trying to fix Wolfie, or skip your whole iOS continuous integration workflow. What would you do? Regardless of the choice that you made in that scenario, the point is, your CI server should be waiting to serve your needs, perfectly, every time. And if you are relying on some old piece of hardware lying around your home or office or home office, chances are, you’re going to spend more time caring and feeding for it, that you would if you had managed it as a disposable resource that can easily be replaced. As tempting as it is to tryout Xcode Server on that old Mac you have lying in your garage collecting dust and rusting, I propose that you don’t waste your time keeping old Wolfie the build server around or even introducing him in the first place, and instead consider approaches where you aren’t in the business of maintaining your own hardware or an isolated build software stack. There’s two paths you can take towards this: all-in-one hosted CI solutions, or configuring an automated deployment of your CI environment to use something like Mac Mini colocation where you can spin up Mac Minis on demand to build your application. Here’s an overview how DayOne used macminicolo.net in conjunction with Jenkins for their builds. Want to run your tests on actual devices? Well then you could even write a script to automatically provision devices from Amazon Device Farm and run your tests on them. This approach grants you the most granularity and flexibility in your configuration, but takes a lot more effort to develop. You need to write the scripts that do the server provisioning, so that they are available and dependable in a repeatable fashion. Sound like too much work? Alternatively, hosted iOS continuous integration solutions have been coming onto the scene lately and look very promising in that they advertise simplistic wizard-based setup of your CI jobs. 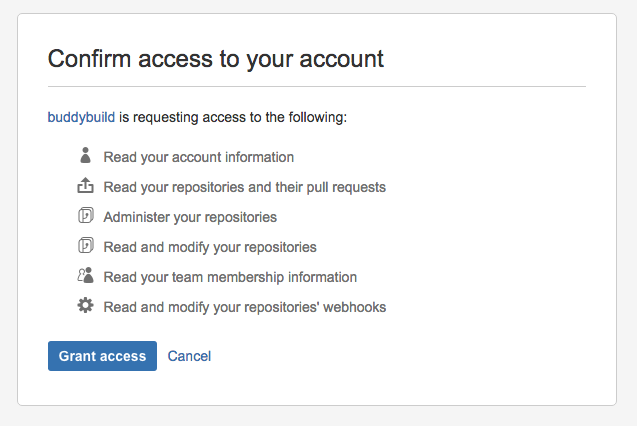 Basically, login with your GitHub credentials (or Bitbucket), select your project, and click Build. Tomorrow, I’m going to give you an overview of buddybuild which is one of the hottest players on the market now in this area. In the meantime, happy cleaning. I came across this article today, called “Continuous Integration on a Dollar a Day” since Jon Reid of qualitycoding.org mentioned it on his Facebook page. I first want to recognize that this article was originally written back in 2006, so no need to repeat the obvious in case you discover this fact yourself. A lot has changed in 10 years, and a lot remains the same. For one, I absolutely recommend using continuous integration. The author also clarifies that the article is intended for people new to continuous integration, so some of the principles are introductory. While I recognize that, I think there are better introductory solutions for your continuous integration workflow For iOS. Having lived with it for so long, it’s not fathomable to consider anything else. To think that I could potentially check out what’s in the source code repository and it not compile is unthinkable. If clean code is your desired end state, then continuous integration can help you achieve it. I am in love with Github pull requests. A past version of me scoffed at thinking that my code must go through code review before it could be considered “done” or merged. I remember using Subversion back in 2010-ish and committing directly to the main trunk of code, with no one review it, and no automated builds. YIKES! 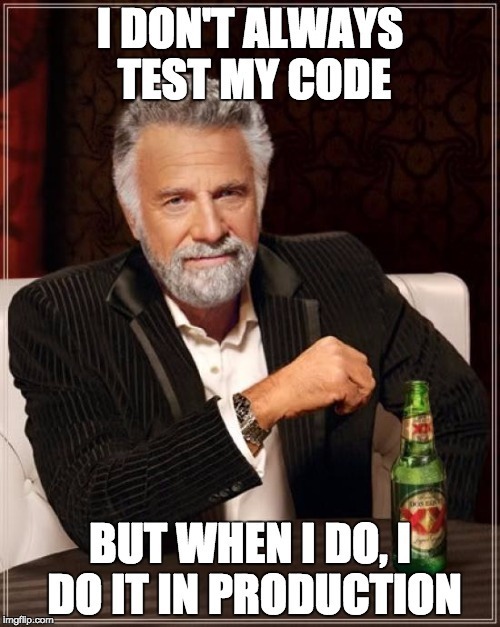 Today though, I feel that a combination of test driven development, code review, and continuous integration truly remove the need for dedicated testers on the product team. That’s not to see we don’t manually test, I’m just saying that it removes the need for something dedicated in that role. I don’t want to git into (pun intended) the pros and cons of other version control systems, I know there are plenty. I use GitHub for all my projects, and I love it. I think you’ll love it too. To sum up pull requests, you work locally in a branch of code. When you’re ready to share it with others, you “push” the branch to the remote repository, and open a “pull request.” An open pull request is basically a proposed change set. Other team members can review the changes, chat about them, suggest improvements. Ultimately, the proposed change set can be accepted, and then is merged into the destination branch where you intended the code to end up. If you want more detail, this is a great writeup directly from GitHub describing the process of using pull requests in your workflow to enable pre-merge code review. So where does continuous integration fit into this? I propose that anytime code is about to change somewhere, continuous integration jobs should verify that the incoming change will compile AND pass tests. The thing is, as you move up the iOS testing pyramid, tests will run slower and slower. Your wait time can really grow if these gate parts of your development. Run your full suite of tests on one device/OS combination each time code is pushed to the repo – I prefer to do this on the lowest iOS version that the app supports. I also usually do this on an iPhone for my Universal apps (no real reason, and I’ve gotten bit by iPad only bugs, so probably worth mentioning that some reasonable amount of thought is worth it here for your situation). Run your full suite again on a different device/OS combination each time code merges on the result of the merge. Each night, run the full suite of tests on every possible combination of devices and OS that you support that is possible within your means. I push a branch to the repository and open a pull request. 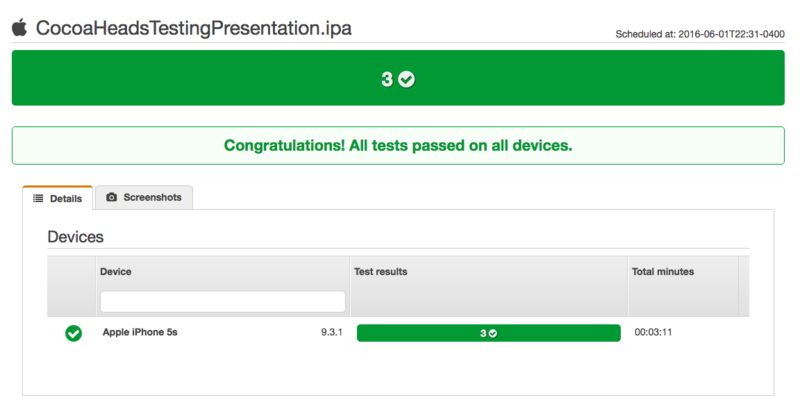 CI server detects the push, runs all tests (unit, UI, and snapshot) on an iOS8 iPhone 5. CI build either fails or passes. CI machine puts a flag in the pull request based on the result of the build. If the build does not pass, it should not be merged. If build is successful, once code merges, a new build is triggered on the destination branch using the result of the merge to run the full suite of tests. If this build fails, manual intervention is necessary to understand why, and be addressed. Starting around 11pm, a sequence of dependent jobs kick off running the full suite of tests across every device that I own – iPhones, iPads, iOS7 (if supported), iOS8, iOS9, etc. Results from “nightlies” are reviewed in the morning. Anytime a build fails, it should be immediately addressed. Failing builds tend to build up over time, especially with the nightlies. If a nightly fails, make fixing it the first thing you do in the morning when you arrive. It usually represents a bug in your code. There is definitely some manual intervention needed in this workflow, it’s not full proof. Ideally, continuous integration works along side you and prevents you from doing anything stupid. Removing any manual steps from your workflow is paramount, and something I’m still working on. 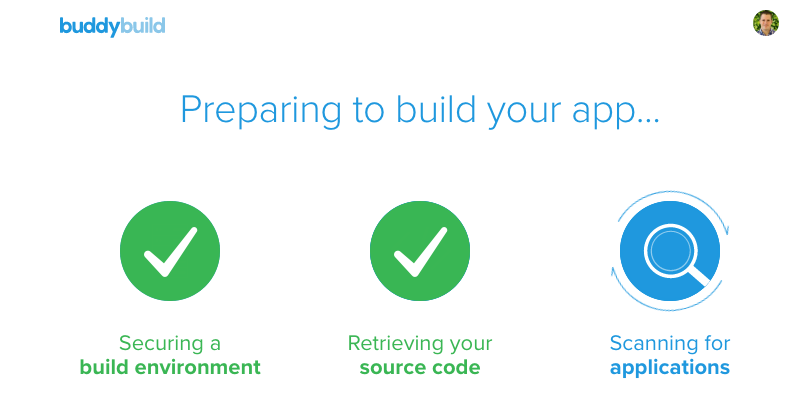 I’d love to hear from you, have you tried a continuous integration workflow for iOS? How has it worked out? Or if not, why not? Following up from my presentation at CocoaHeads last week, I heard some feedback on my proposed iOS Testing Pyramid. Specifically, Andres Catalan challenged my removal of the service layer. He told me that he felt like I underplayed its importance. Removing it as something worth of dedicated testing meant that you’re missing out at a key way to add quality to your application. I think he made a good point, and I wanted to acknowledge it here. 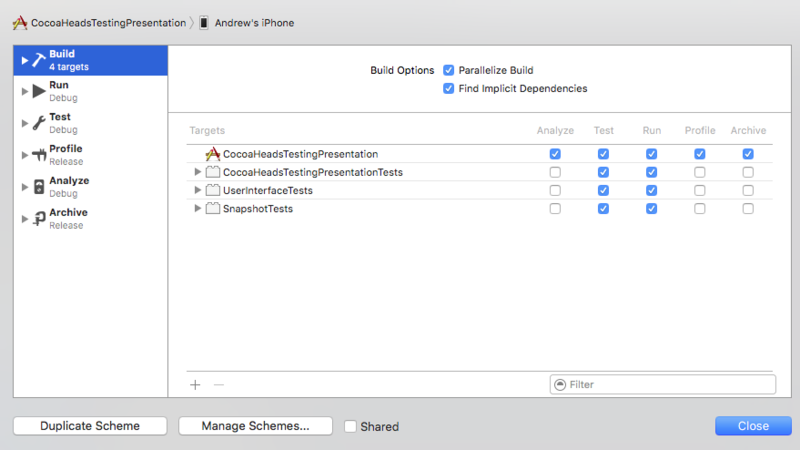 Tools like CocoaPods and Carthage (and soon the Swift Package Manager) make it so easy to include third party code with your apps. I’ve taken advantage of these to great result, they’ve certainly brought so much to my apps. Despite whether you use a dedicated package manager, or manually add the code to your project, the thing is, you are adding someone else’s code to your project. This code is subject to change, and certainly contains bugs (regardless of whether you’ve found them or not). The question is, should you, as a consumer of the third party code, write tests for this code that you’re consuming? Often, this code that you’re consuming “as a service” connects with crucial parts of your application. Personally, I’ve gotten great use of SSKeychain as a wrapper on the keychain. The keychain stores secure data, so it’s hard to think of something more critical than that! Making sure that this third part service works as advertised is of fundamental importance to my app working, AND the security of my users. So the question presents itself, how should consumption of code like this be tested? When should it be tested? Who should be testing it? If you, the consumer, do decide to test the service layer, there’s two things I advocate when considering “what should be tested?” Only the API that you are using should be tested, and only test from the outside-in, even if you have the source. For example, using SSKeychain, there are several different methods available for storing and retrieving data in the keychain. I only ended up using a subset of those in my application. If I were to write dedicated for my use of this “service layer” then I wouldn’t write tests for anything beyond the methods that I was actually using. In other words, you don’t need to write comprehensive tests for every publicly available API method for the third party library. And furthermore, when writing tests, consider your perspective as a consumer. Often, dependency tools like CocoaPods include dependencies from open source projects where the full source code is available. Despite having access to the full source code, DON’T TEST IT! Stick with the public APIs. I like to main strict manual control of the third party code that I integrate with my applications. As a result, I specify exact versions of CocoaPods and Carthage dependencies in my code, while also checking in the third party code into my repositories. Don’t forget how one programmer broke the internet by deleting a piece of code from his NPM package. I absolutely advocate maintaining a local copy of the third party code that you use, so that if it disappears from the public repository, you aren’t dead in the water looking for your third party dependency. When considering, “when this should be tested?” I put all of this into consideration. How frequently will the code change? How frequently will by use of the third party code change? To sum it up, if I ever upgrade versions of the third party code, or if I change my use of the third party API, specific consideration for testing must be made in order to maintain high quality of code. Well, this is the million dollar question (not really). The long story short, in my opinion, is that the original author should be testing their code, and including those tests with their open source code repository. Assuming that the project is open source, it’s easy enough to see if the tests were included. This isn’t always the case. I can’t tell you the number of times that I’m browsing from open source project to project, and there are zero automated tests included. If that’s the case, you absolutely should consider writing these tests yourself through your own consumption of the API. At the end of the day, if I do find myself writing tests for the service layer, more often than not those tests are going to be bundled with my other tests – the unit and UI tests. They won’t be dedicated tests for the third party code. And I’ll rely on design patterns like Adapter to encapsulate the third party code into a closed off portion of my own code base so it can be swapped out down the road if needed. I hope I gave you some useful things to consider in your efforts for deciding whether testing the iOS service layer in your iOS apps is worth it. I want to thank Philly CocoaHeads for an awesome opportunity to spread the word on automated iOS testing. I’m happy with how the presentation turned out, it was a great audience, and there was some really insightful conversation throughout the night. It turns out, the presentation was recorded and will be hosted online for anyone to watch. As soon as it’s up, I’ll link to it here and share it with you all. XCTest – Apple’s main test framework, that is the foundation of unit tests, and a lot of other test tools. Xcode UI Tests – WWDC 2015 video introducing the revamped UI testing framework from Apple. OCMock – If you’re testing Objective-C code and need to write mocks, THIS IS AWESOME. Unfortunately, doesn’t totally work with Swift. KIF – What I’m currently using for UI tests. FBSnapshotTestCase – Use it for your snapshot tests. Your Fingers – Useful for manual testing. Martin Fowler’s Test Pyramid – Not a tool, but the original documentation. AWeber – The company I work for. The project I used tonight represents a bare bones project configured with 4 targets. The main target, a target for unit testing, a target for KIF testing (UI/Functional tests), and a target for FBSnapshotTestCase testing. I used Carthage to setup the dependencies. If you’re looking for the project, you can find it on my GitHub at: https://github.com/obuseme/CocoaHeadsTestingPresentation. raywenderlich.com Video Series on Testing – Greg Heo’s video tutorial series on iOS testing at raywenderlich.com. It largely focuses on Apple provided tools. raywenderlich.com Mock Objects Tutorial – A tutorial dedicated to different mocking techniques. qualitycoding.org – Jon Reid is an awesome thought leader in the iOS testing space. His site is really useful, and I continue to learn a lot from it. My Favorite Things – I mention a couple “real” books and posts on other sites that I’ve written on refactoring and testing.